Scotty Lee and the Stingrays were a coming together of several local bands in the mid 1960's. 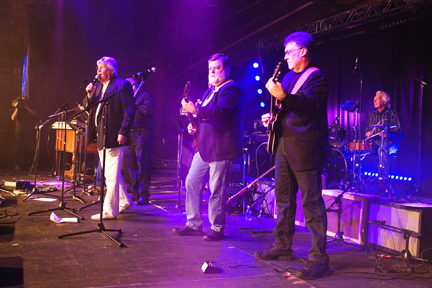 It all started when singer Larry Gruseth sat in with the Lancers during their last performance at De Smet Teen Town. Drummer Scott Klaverkamp and bassman Frank Stride were going to put together a new band and invited Larry to join. Larry brought band mate and guitar player Dave Austin of the Couriers to the rehearsal, where they met up with Scott, Frank, sax player Mike Rothenbuehler also of the Lancers keyboardist Rod Jerke of Jason and the Argonauts. Lonnie Moehnke, also of the Argonauts, joined shortly thereafter. Then came trumpet players Barry Bryan, and Ron McKenna, along with organist Cam Thraen. Scotty Lee and the Stingrays were originally booked by R & G Enterprises. They rehearsed and performed regularly at the Dell Rapids Ballroom to capacity crowds and were quickly in demand at other South Dakota ballroom and bar venues. The group always performed a wide range of rock n' roll songs, and with the addition of more brass branched out into R&B. Eventually, they came to the attention of the famous Jimmy Thomas who signed them to open for The Happenings when "See You in September" was still in the top 10 and "Go Away Little Girl" was climbing up the charts fast. This led to Thomas booking Scotty Lee and the Fabulous Stingrays throughout the Mid-West at top ballrooms and clubs. After the group dissolved, member of Scotty Lee and Stingrays enjoyed success on their own and with other groups. Rod Jerke went on to a full time music career that has allowed him to work world wide with a virtual Who's Who in Rock n' Roll. The list is seemingly endless and names like Gene Pitney, Del Shannon, Bobby Vee and Tommy ore are just the tiop of the iceberg. He currently heads up the popular group Powerplay. Scott Klaverkamp toured the midwest and the nation with several groups, including the Pilgrims, Nickel Bag of Soul, Priceless, Showcase and Powerplay. Barry Bryan toured the world with million selling artists Santa Esmerelda, was offered an audition by a little group called "Chicago", and worked with some of the members of Tower of Power. He has also performed on numerous recording sessions. Mike Rothenbuehler later joined the Hursemen, and was the co-founder with Lonnie Moehnke of the Prairie Fire Band. The Prairie Fire Band performed regularly at the area's most poplular venues. Larry Gruseth became a part of the Harvey Wallbanger Big Time Band, and later formed Larry Grussett and Cashbox. He recorded several songs at various times. His version of "Rave On" received regional air play and regional jukebox play. Dave Austin is deceased. Following the Stingrays, he performed as the lead guitarist for several northeastern South Dakota bands. Ron McKenna went on to join the Pilgrims, and later became a successful business man in California. Cam Thraen stopped performing after the Stingrays. He obtained his PhD and is a professor at Ohio State University.